What is the best Walk Behind Leaf Blower of 2019? 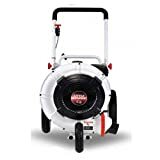 The Southland SWB163150E Walk Behind Leaf Blower is the best walk behind leaf blower you can buy for the value it provides. It’s tough getting rid of leaves and debris from your garden. That’s why you moved from using a rake to a good leaf blower. But when the garden is large and the debris is hard-to-remove, you need something better. Something that gives you even greater blowing power and performance. That’s where a walk behind leaf blower can help you. 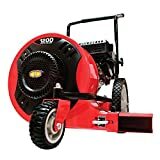 Let’s take a look at the best walk behind leaf blower you can get for blowing away the leaves and debris in your garden. Do you need a walk behind leaf blower? A leaf blower is a tool that comes with a powerful motor that blows air out of a tube. A walk behind leaf blower has a very powerful motor that is mounted on wheels and can be pushed around the garden. The blower can be used to push around debris like leaves, sticks, and twigs to a collection point. There are different types of leaf blowers available like a backpack, handheld, or walk-behind. A handheld leaf blower is one you can carry in one hand to blow away the leaves. They tend to have lower power compared to backpack ones. A walk-behind blower can be equipped with a powerful motor suitable for commercial needs. But they are not easy to move around. The electric leaf blower could be corded or cordless. The corded one needs to be plugged into a socket so it can start blowing air. A cordless one comes with a battery that can be charged and used as a source of power. The corded ones are lightweight, easy to use, and inexpensive. The cordless ones have better mobility but become a bit heavier due to the battery. A gas-powered leaf blower comes with a large gas tank so you can use it for a long time before it needs a refill. They tend to need more maintenance, are a bit tricky to use, and heavy. If you have a large garden and don’t mind the effort of raking the leaves, you don’t need a leaf blower. But if you’re suffering from a bad back and want to get this work done with little effort, a walk behind leaf blower can be useful. It’ll help you get rid of wet and dried leaves, sticks, and hard-to-remove debris from your garden without breaking a sweat. There are some factors that can help you make the best buying decision for a walk behind leaf blower. A walk behind leaf blower is a piece of expensive equipment. That’s why you want it to be durable and give you good performance for a long time to come. The durability of the tool will help you determine how good it will work and for how long. Choose a brand that you can rely on to give you a good quality tool. It’s OK to get an expensive leaf blower if you know the value it’ll give you for the longest period of time. A walk behind leaf blower is gas powered. So the engine capacity is measured in cc (cubic centimeter). The higher the value, the better the performance will be. How powerful you want your leaf blower to depend on the area of your garden and how fast you want to get the work done. But a higher performance means the walk behind leaf blower will cost that much more. The walk behind leaf blower is a gas powered one. But the engine could be 2-stroke or 4-stroke. A 2-stroke engine gives you better performance but this comes at higher maintenance and complicated use. You need to use a mixture of oil and gas for the 2-stroke engine. The 4-stroke engine does not have this problem and needs less maintenance in comparison. It also produces less noise and emissions compared to a 2-stroke one. A walk behind leaf blower comes with a large gas tank so it should run for a while before a refill. Choose the blower based on how big gas tank you would need for your garden cleanup needs. If the walk behind leaf blower comes with reduced emissions and improved efficiency, choose that one. The performance of the leaf blower is determined by the speed at which it can blow air. You want to check the airspeed of the leaf blower that is measured in MPH (miles per hour). This should be considered along with the CFM (cubic feet per minute). It’s the volume of air that the blower can throw out per minute. The walk behind leaf blower is a big piece of equipment. That makes it heavy compared to a handheld or backpack leaf blower. But the walk behind leaf blower can come with different weights. So pick one that you’re most comfortable pushing around the yard for a long time. If you’re going to use the walk behind leaf blower for a long time, it should have an ergonomic design. This makes it comfortable to use. The handle should be padded and comfortable to hold while using the blower. You want the blower to have a good set of front and back wheels. This helps maneuver the blower in the garden with ease. It’s nice to have a flap that helps control the air direction. This will make it easy to blow away the leaves without bending yourself. It should be easy to handle the controls of the blower and vary the speed if required. A gas powered walk behind leaf blower is going to be noisy because of the gas engine. But there are some blowers that produce less noise than others. The noise is measured in dB(A) and you want to get a leaf blower that comes with as low noise as possible. A walk behind leaf blower can be expensive compared to the other types of blowers available. But you get the speed, power, and durability that makes cleaning your garden a breeze. It’s OK to spend a little money if you’re getting the quality and performance that lasts for many years. It’s a feeling of relief to use a leaf blower with a good warranty period. In case something goes wrong, you know it’ll be taken care of. The walk behind leaf blower could come with a warranty that ranges from one year to several more. The warranty can vary based on whether you use it for home or commercial use. It’s important to read the instruction manual that comes with the walk behind leaf blower. This will help you learn about assembly, using the blower, and maintenance. Make sure the gas tank is full before you try to use the leaf blower. Start the blower and use it in the direction of the wind. This will help you get the best performance while reducing leaves flying on your body. The walk behind leaf blower creates a lot of noise. Wear earplugs to protect your ears. A good pair of safety goggles protects your eyes from debris. Long sleeved shirt and pants can protect your hands and feet from flying debris. Check with your neighbors if they’re OK with you using the walk behind leaf blower. And what time would be most suitable for them. Make sure the work area is clear of children and pets before using the leaf blower. Check that the work area is free from any furniture before using the walk behind leaf blower. If there are large debris or branches, take the out of the area. Start the walk behind leaf blower and use it in a semi-circular pattern so that the leaves and debris move to a particular spot. You can then collect the leaves in a bin for disposal. Use the leaf blower in short bursts to move the leaves to your collection point. This will give you good performance and conserve the fuel. If the pile becomes too big, the leaves will start blowing in the air. It’s better to use a rake or your hands to lift the leaves and put them in the bin. Don’t try to blow the leaves against a wall as they’ll bounce back on your body. Blow the leaves along the wall to the spot you want to collect them. Before and after using the walk behind blower, check if there is any debris stuck to it. If so, you can use a clean cloth to remove it. Check that there is no damage to the blower parts before using it. Check that the air filter, spark plug, and fuel lines are clean and free from damage. If there is any damage, you’ll need to get them replaced. Once you’re done using the leaf blower, store it in your garage or shed away from children and pets. The Southland SWB163150E is a walk behind leaf blower that comes with a 163cc powerful motor. This is capable of giving an airspeed of 150 MPH and an air volume of 1200 CFM. It comes with a manual recoil easy start fuel delivery system. The steel fan that comes with this blower is well balanced so you won’t feel the vibrations when using it. This will help reduce fatigue on your arms. The flow adjustment system means you’ll be able to control the air flow with ease. There are 12-inch rear wheels and a swivel wheel at the front. This helps to maneuver the blower without much effort. This blower is durable thanks to the tapered crankshaft and steel fan housing. The unit weighs 95 lbs which makes it easy to move around with less effort. The Southland SWB163150E comes with a limited two-year warranty against manufacturing defects. The Patriot CBV-2455h is a 3-in-1 product that comes with a blower, chipper, and vacuum. The engine comes with a 5.5 horsepower that can give you a strong airspeed of 150 MPH. It’s easy to convert the vacuum into a blower with the flip of a handle. The Honda engine that comes with this tool is durable and generates less noise. 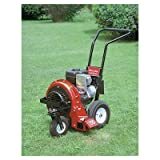 This blower comes with 10-inch wheels that make it easy to maneuver around the garden. It is easy to start this blower with a single pull but it can feel heavy due to the durable, well-constructed impeller. It would be nice to have an adjustable flap to divert the airflow but it’s a missing feature. 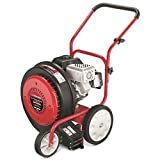 The weight of this blower is 97 lbs which makes it easy to use in the garden without getting ffatigued The controls are easy to use and ergonomic. The Patriot CBV-2455H comes with a limited two-year warranty that is useful if something goes wrong with the product. The Troy-Bilt TB672 leaf blower comes with a 208cc overhead valve engine. This has good power that gives you an airspeed of 150 MPH and an air volume of 1000 CFM. This should be sufficient to blow wet and dried leaves as well as sticks and debris from your yard. The 90 degree front discharge chute will help you get rid of the leaves with ease. The handle is rubberized and comfortable to hold while moving the leaf blower in your yard. The Troy-Bilt comes with semi-pneumatic ball-bearing wheels that makes it easy to maneuver around in the yard. This walk behind leaf blower comes with a limited two-year warranty that should help you use it without worrying about break down. This leaf blower weighs just 78 lbs which makes it very lightweight and comfortable to use for a long time in the yard. The Merry Mac LB1100EZM is a walk-behind leaf blower that comes with a 250cc engine. This is powerful to give you an airspeed of 185 MPH and an air volume of 1850 CFM. This great performance can help you get rid of large leaves as well as tough debris from your garden. The front-locking swivel wheel comes with two height adjustments. It can be used to maneuver the leaf blower with ease. It has an adjustable loop handle that comes with an anti-vibration grip. This makes it easy to use for a long time without fatigue on your arms. The axle gussets that come with this blower provide more stability. The adjustable deflector helps you divert air in various directions without having to bend over. The impeller is powerful and balanced for a smooth operation. The Merry Mac LB1100EZM weighs about 135 lbs which makes it heavy to move around for a long time. The warranty is a limited two-year one which is useful in case something goes wrong with the leaf blower. The Little Wonder 99170-03-01 leaf blower is a walk behind type that comes with a Subaru SP170 engine. This is a 170cc capacity engine that gets you an airspeed of 200 MPH and an air volume of 1150 CFM. This powerful performance along with the 16-inch composite impeller helps you get rid of dried and wet leaves as well as hard-to-remove debris from your yard. The Aim Right Adjustable Discharge Nozzle helps you divert air in the required direction during operation. The operator handle comes with a thick padding which makes it comfortable to use. The operator handle also folds making it easy to store. The 16-inch solid wheels help you maneuver the leaf blower around the yard with ease. This leaf blower weighs 102 lbs which is comfortable enough to use in the yard for a long time. The Little Wonder 99170-03-01 C5 comes with a limited two-year warranty. So you can use the leaf blower without worrying about damaging it. The Southland SWB163150E Walk Behind Leaf Blower is the best walk behind leaf blower you can get. The 163cc motor is powerful enough to give you an airspeed of 150 MPH and an air volume of 1200 CFM. It’s well balanced and you won’t feel the vibrations when using it which helps reduce fatigue. It’s lightweight weighing just 95 lbs so it’s easy to use for a long time in the garden. It’s easy to control the air flow with this leaf blower so you can target the debris. And it’s easy to maneuver thanks to the 12-inch rear wheels and a front swivel wheel.